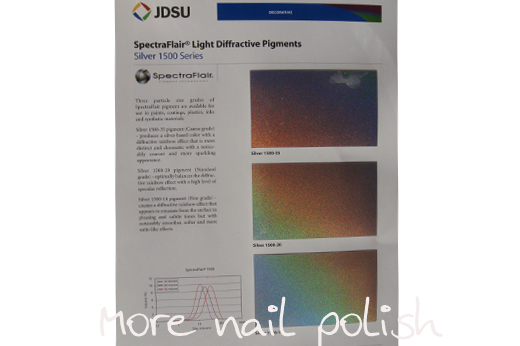 With my recent post about the colour changing pigments, I've had a number of inquiries about sourcing SpectraFlair. SpectraFlair is also one of the top search terms that brings people to my blog!? Recently, the Australian supplier sent me some documentation in the mail, which included a brochure that had printed SpectraFlair samples on it. Here is a picture of that brochure. Each sample showed one of the three different grades. 1500-14 (fine grade), 1500-20 (standard grade) and 1500-35 (course grade). The second figure relates to the micron size of the particle. Now even the course grade particles, at 35 micros are minuscule, given that the recent colour morphing pigments are an average of 90 microns. And for the record, there are 1000 microns in a millimeter! This is standard grade 1500-20. This is course grade 1500-35. 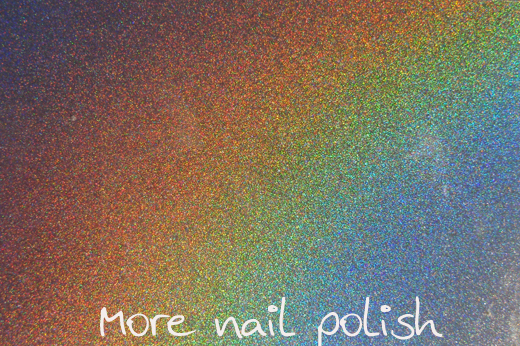 As you can see for yourself, the larger the particle the brighter the rainbow holographic effect. So far, the Spectraflair that everyone has been getting has been the standard grade 1500-20. I have now been able to get my grabby little hands on some of the course grade 1500-35. 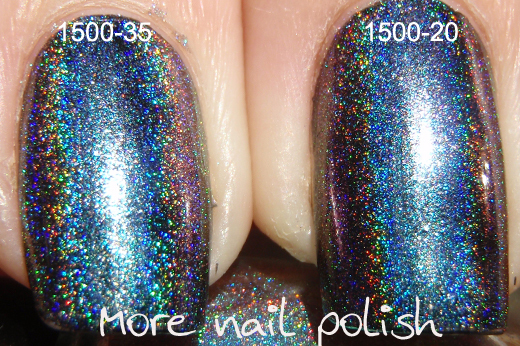 I made up another mini bottle of my Ozotic 505 holographic multichrome, this time using the 1500-35. 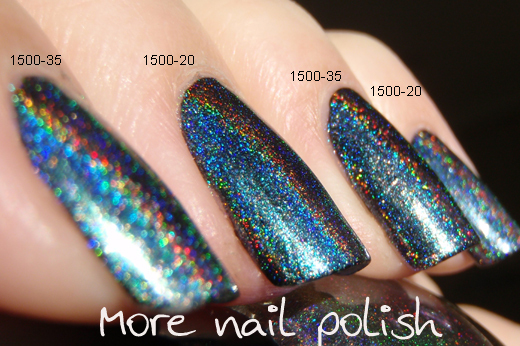 I decided to do a comparison swatch with my previous franken which used 1500-20. The difference between them isn't much, well in fact it is exactly 15 microns!, but now that I have both the fine and the course grade to compare, I prefer the course grade 1500-35. I also did a blind test with my mum and husband to see which they preferred. Both chose "the one with the brighter rainbow". I'm not sure if my pictures really captured that the 1500-35 is noticeably brighter, but it definitely is. 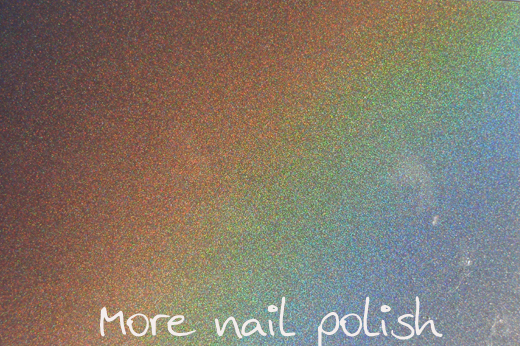 It is also more noticeable on the nail in lower light situations. I have a quote to purchase 125 grams of spectraflair. I'm planning on getting the 1500-35, as it has a stronger rainbow effect, but is still very linear. It is also different to what we have all already got. This stuff aint cheap. It's a much more expensive product that the colour morphing pigments. However, I would be able to sell it to you guys for $15 Australian dollars, (+ $2.50 postage). Packaged in the same little pots that I'm doing the colour morphing pigments in. This is the same price that Sid sells it for per gram (although Sid doesn't sell one gram amounts any more) And don't feel bad that I'm taking the old guys business, because that is who I'll be getting it from. This price is also quite a bit cheaper than the other guy who is selling through ebay (currently £20 with postage = approx $32 AUD). 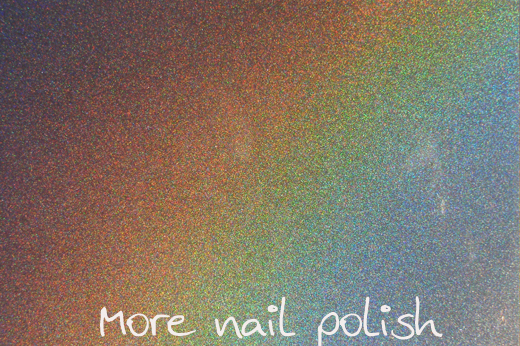 I'm planning to do more SpectraFlair frankening soon, specifically to find some good base polishes that mix well and come up with some easy to follow recipes for others to make. I know that a lot of people are not confident with frankening, so while I don't consider myself an expert by any means, I want to be able to share my experience. NOTE - this post is from 2011 and I no longer sell any spectraflair products nor will I be in the future. I'm anxiously awaiting to hear when you'll be selling some again, as I missed out on the first run! ohhh i def want in on this aswell. YES!!!!! i am very interested in this spectra-flair and it seems right to divvy it up , i think we chatted about that how it comes in bulk sizes previously. Yes!!! I'll definitely get some from you if you have it and sell at the price you said above. The expensive price the UK seller ask for on ebay put me off from getting it. But I do want it if the price is reasonable. 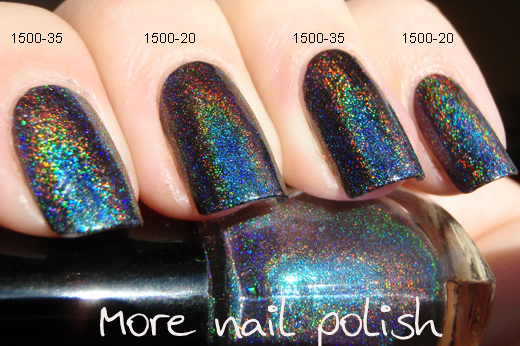 This is awesomesauce!If the companies won't make holos for us, we can make our own. I love it! I would so be all over that!! And would also love some frankening recipes, I've wasted too much polish on dud frankens already! I'm on it like a duck on a junebug! Ice Queen - humm mixing both together? I don't know if one would overpower the other or whether it would have more depth, because of the difference sized particles. I'll have to try it. EVERYONE - Its on!! I'm ordering it. I'll let you all know when I get it and package it up, then we can do payments. CaCa - yep $15 AUD +2.50 postage for one gram. 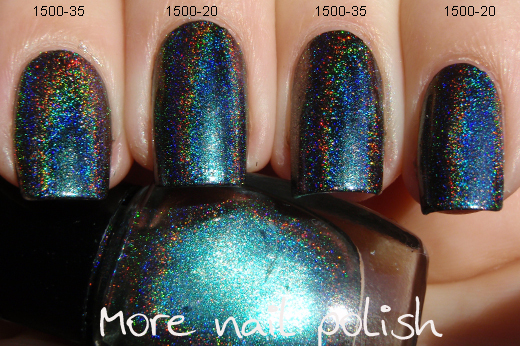 and you can get at about 8 polishes out of one gram. I'd like to buy some! Did you try to make a white holo yet? snailsonnail - yes, of course - Worldwide shipping for $2.50. 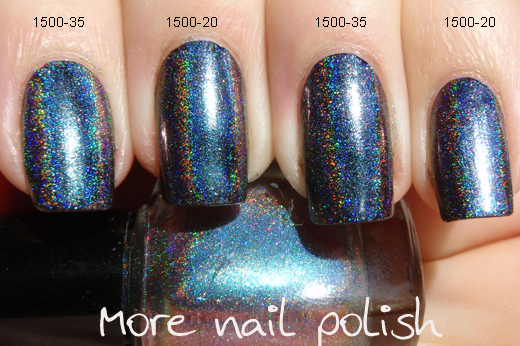 Lacquerista - I've had one miserable fail trying to create a white holo, I probably should have shared it on my blog, but it was pretty bad! But I'm determined to make one. I would definitely buy some! Do you plan to ship it worldwide or just in Australia? WOWsers everyone - If as many people buy it as have said yes to the little poll, then 125 grams isn't going to be enough!! I'll consider buying another batch if the first lot sells out. Will you just put the grams up for sale here then? Thanks! kksmom - I'll do a post to let people know when I have it in stock, then the first payments through will get what have. OMG, this is so crazy!!! oh myyyyy....this is so exciting! hopefully I'll be able to buy some from you! Yes I want it, like everyone else! For the american readers: the UK seller that was mentiioned, in US dollars buying from him would be $32.78 compared to $18.31 from Kitties26... and I've checked, there is no where else to purchase it. I know I'm late jumping on the spectraflair bandwagon, but I seriously would love to get my hands on some as well. Thanks so much! omg, omg omg....are you still selling the spectraflair 35 grade? I NEEED some....I'd love to buy 4 or 5 grams if possible! If you are still selling spectra flair, I'd love a gram of both grades if you can. If not I'll take 2 grams of whatever you got! Are you still selling the Spectraflair? I'd love to buy some! Please contact me at joojoobeezz@gmail.com!! Hi Kitties26 I would love to order 2 grams of the 1500-35....Loved your demo..I have paypal..hope that's okay. beautyandthebling@yahoo.com Looking forward to hearing from you soon! Send in Italy? How much would the shipping to Italy? Hi, I'm so interested, is it possible to ship it to south america, and if it does, how much would it cost? I understand it is 17.50 AUD? Which is perfectly fine by me. Are you still selling it? If so please email me at leslee_lane@yahoo.com. Hi there!! I was wondering the same thing!! Are you still selling spectraflair!! I really really want it!! Email me at jandaly@hughes.net when you get a chance!! I'm from Ontario Canada and hope you can ship to me?? same exact question as helen2912, are you still selling this? Thanks! I WANT TO BUY. CAN YOU GIVE ME THE INFO? THANKS! If you're still selling some, I'd love to get in on it! Im from the U.S. and I would reallllly love to buy some of the course grade. Im not really sure how to go about that though. Im from the U.S. and I would reallllly love to buy some of this course grade spectraflair, but Im not sure how to go about it. Do you still have the standard grade for sale? cause I'd really want it. I just want to post that I am no longer selling any spectraflair. Sorry everyone. Hi, I'm so interested, is it possible to ship it to south america, Brazil to be more specific, and if it does, how much would it cost? I need like 6 grams , will you let me know if u sends to México? Please let me kniw, my mail is patyleroux arroba hotmail.com U hope you understand why i write my mail this way. Regards.